ELESTER-PKP is a company dealing with the creation of modern and innovative solutions in the field of automation and remote control in the railway sector. We are a Polish leader in the field of field and protection automation of DC power systems for traction substations and the creation of rail and tram electrical power supply control systems. ELESTER-PKP is a company that is constantly developing and always using new solutions. The ideas and devices created by our employees often determine further directions of changes and development for the entire rail sector in Poland. The company is a laureate of many industry awards and distinctions. Also appreciated by experts from other industries. Ensuring the reliability of equipment operation has been our priority task for years. We have implemented a number of internal procedures to monitor and improve our products and systems. One of the policy elements is the implemented ISO 9001 quality management system. The company certified it in 1997. It was one of the first implementations of this system in the entire railway sector in the country. 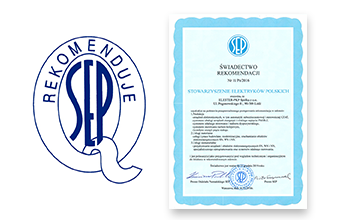 ELESTER-PKP also has the recommendation of the Association of Polish Electrical Engineers (SEP), which regularly renews since 2008. The SEP Recommendation confirms the highest quality of the company's equipment and systems as well as proof of technical and organizational advancement.